Since its inception in 1958, the Philadelphia Industrial Development Corporation (PIDC) has best been known for playing an integral part in the growth and development of the city’s industrial and manufacturing sectors. As the makeup of the economy changed in Philadelphia, so did PIDC. It began helping many different types of businesses in Philadelphia: from small to large, for-profit to non-profit, in every business sector. The name they had been known by was no longer reflective of their breadth of work. Their brand identity had become confused, and they looked to LevLane to help them tell their story. Conduct, Create, Change: LevLane began rebuilding the brand from the inside out, determined to uncover everything from the products and services that were offered, how employees and outsiders spoke of PIDC, to how the receptionist answered the phone. After conducting many interviews with internal and external key stakeholders, the LevLane team began to uncover the brand’s perceptions and truths. It was evident that different Philadelphia businesses, as well as PIDC employees, had varying awareness of all the work of PIDC, causing brand recognition issues. LevLane’s rebranding campaign would soon help to solve this problem. LevLane suggested that Philadelphia Industrial Development Corporation solely be referred to as PIDC, then crafted an external positioning statement that described exactly what PIDC does: “Driving growth to every corner of Philadelphia.” In addition to its industrial heritage, PIDC wanted to focus on its small business lending and community development initiatives. Next, it was crucial that the internal key messaging be clear for all. LevLane developed new brand messaging that ensured each PIDC employee would be communicating the same consistent message. Finally, LevLane developed a comprehensive, multi-year marketing and communications plan that included a re-branding with a media plan to support it. 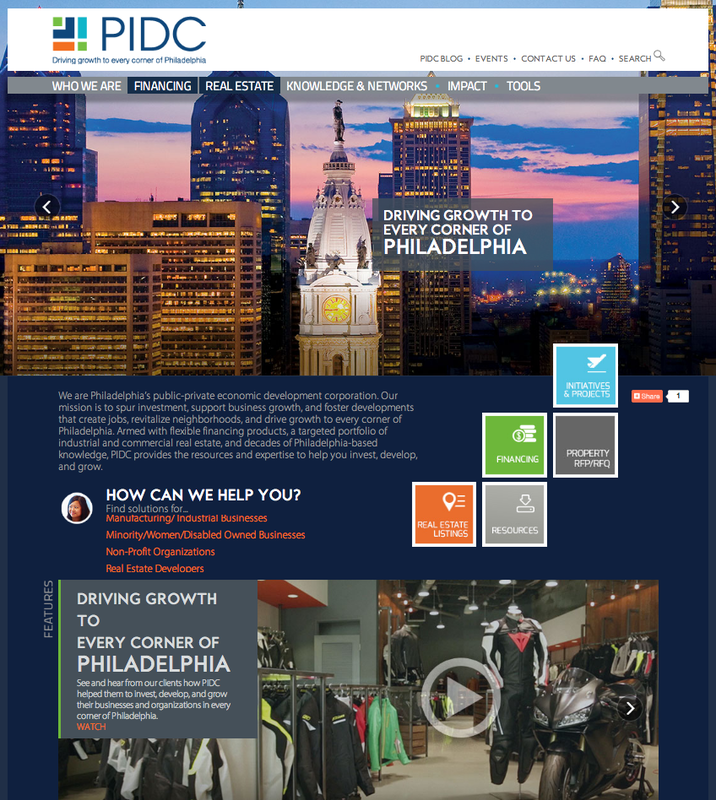 The creative team stayed busy, and launched PIDC’s new website and campaign in October 2014. Complete with a new logo, messaging, color pallette, website, corporate brochure and collateral, it was out with the old and in with the new! “It’s important for the community to hear our client success stories firsthand and the ways in which they’re contributing to Philadelphia’s economy. With the creative direction of LevLane and other partners, we were able to put together a great video showcasing our clients and the work we’re proud to do every day,” said Anne Bovaird Nevins, Senior Vice President, Marketing and Business Development for PIDC. LevLane is confident that PIDC will continue to flourish for years to come, driving growth to every corner of Philadelphia!